Altar Servers offer service to God and the community by assisting the priest during mass. The ministry is open to all youth of the parish who have made their First Communion and whose parents believe they are ready and responsible enough to be trained. Click here for Our Lady of Guadalupe Altar Server Schedule. Click here for Santo Nino de Atocha Altar Server Schedule. This liturgical ministry is responsible for distributing the Body and Blood of Christ at the weekend Masses and other times Mass is celebrated. Some also take Holy Communion to the sick and homebound. Click here for Our Lady of Guadalupe Extraordinary Minister Schedule. Click here for Santo Nino de Atocha Extraordinary Minister Schedule. As ministers of hospitality, ushers welcome the community as they enter the Church, especially newcomers to the parish. They open doors, greet, hand out bulletins, and assist with the Offertory collection and procession, as well as guide people during communion procession. Click here for Our lady of Guadalupe Lector Schedule. 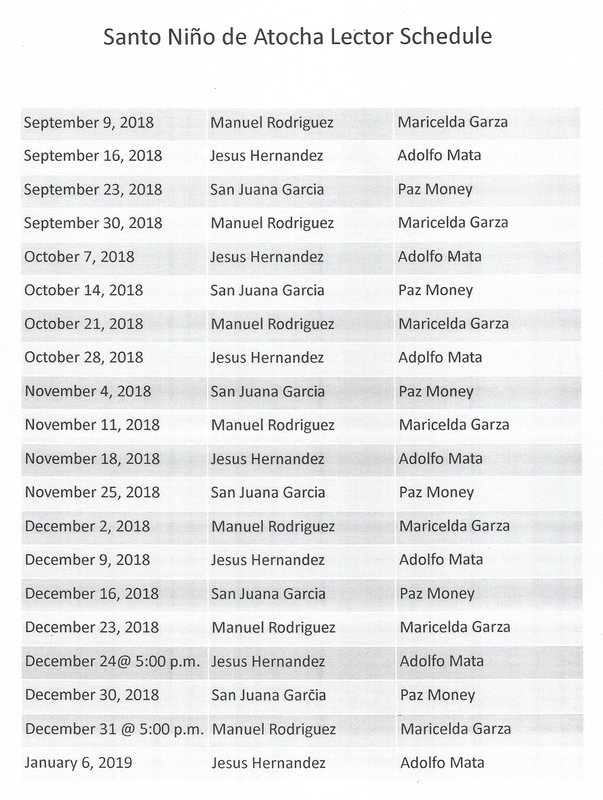 Click here for Santo Niño de Atocha Lector Schedule. A group that counts the funds collected at Mass each week. Each group volunteers about twice a month. Sacristans assist in the preparation of the worship space for liturgies. Responsibilities include the care and preparation of the sacred vessels, lighting of candles and placements of the gifts, and monitoring of ministry schedules before Masses. In doing so, they ensure that the liturgies flow smoothly and that the church and its ministers are prepared for the celebration. An ability to multi-task is important for this ministry. 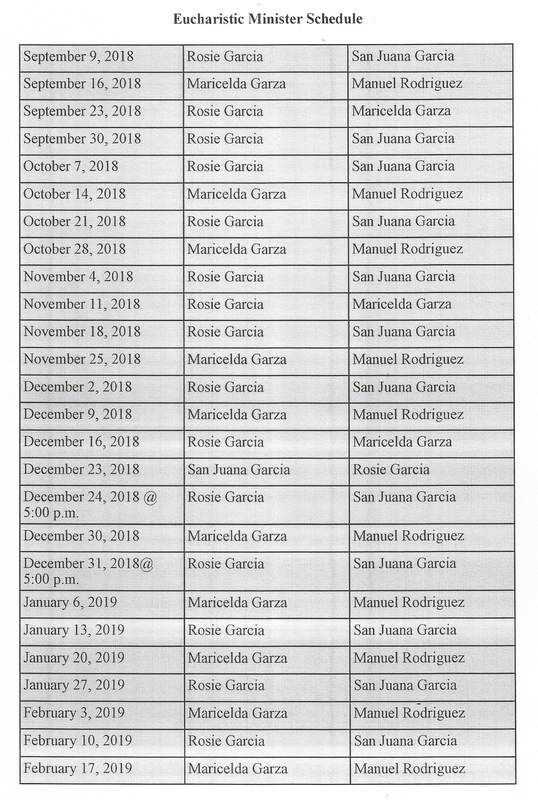 Click here for Our Lady of Guadalupe Sacristan Schedule.